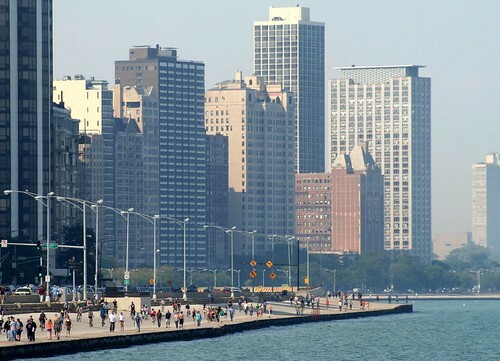 Well, guess what I saw not a day later as I biked along the lakefront trail? 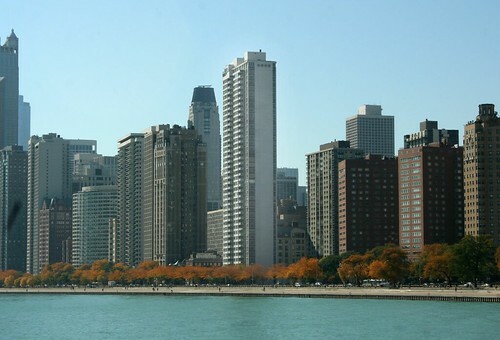 While not a precise stylistic match to the blocky Manhattan buildings (quite a few of the Chicago examples tend toward New Formalism as much as pure International Style), Chicago does indeed have several buildings representing the same ethos, from exactly the same time period. 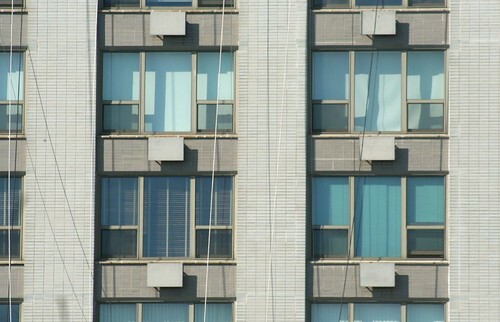 These buildings share common elements beyond their cladding. All were built with clean modern designs that practically demand a simplified, modern and efficient life. 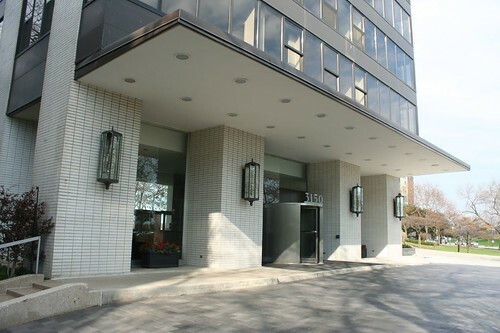 The designs were matched by a host of modern features like central air, electric kitchens, attached indoor parking garages, even security cameras in the lobby that residents could view from their apartments. Most offered luxury amenities like maid service, 24 hour doormen, and rooftop pools and party decks. 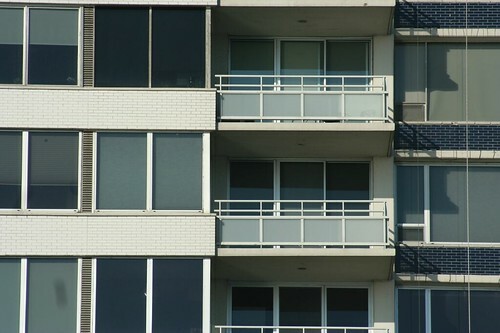 Circa 1962, these buildings offered the ultimate in urbane luxury living. 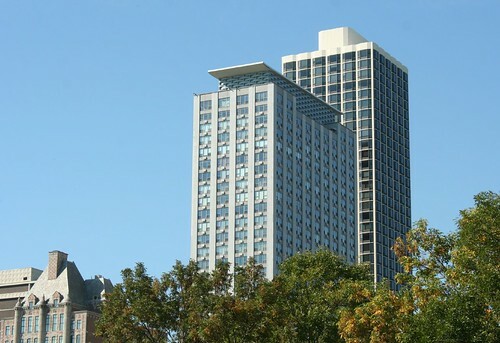 Developed by local builders Mack & Sher, this 33-story tower was planned to include “every conceivable luxury”, including sizable family rooms. Its distinctive top includes a rooftop dining and party space available to the residents. 180 cars can park in the garage. It was topped out in 1959. The address continued to appear in society pages with some frequency in the years following its completion. This building rose on the site of the 1910 Richard T. Crane mansion; Mr. Crane died in 1931 and his widow passed away in 1949. The Gothic mansion was razed in 1955, originally for a parking lot. 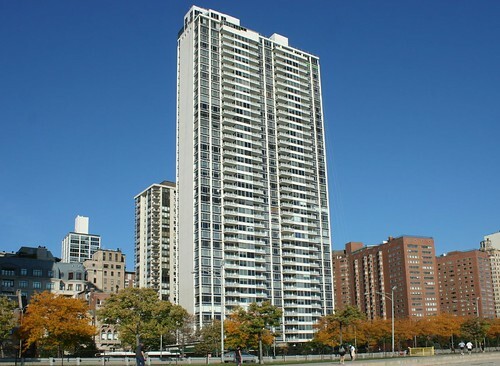 Opened in August 1963, 3150 Lake Shore was described in Lake Shore Management’s glowing prose as “the Crown Jewel of the lakefront!” The 38 story building has 6 elevators, serving only 2 apartments per floor. The building exhibits a number of curiosities; not least of which is the marked similarity of its massing to its sibling at 1550. Both share a large rooftop mechanical penthouse, artfully designed to cap off the building, rather than left as an unconsidered collection of boxes atop the structure, as has happened so many times elsewhere. The design also makes the curious choice to have powerful vertical elements on the broad faces, but only horizontal banding on the narrow ends. The garage is housed in a wonderously pure box of white brick. 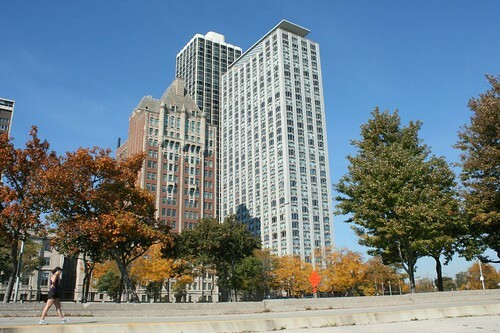 3150 LSD was previously the site of a 1919 mansion built by Frank D. Stout, a “capitalist” who made his fortunes in lumber and went on to become director of various banking and railroad enterprises. Mr. Stout died in 1927; his widow passed away a decade later. The mansion became home to the contentious Kenner Hospital, a 65-bed unit, fined in 1948 for operating without a license and repeatedly in the news for its various problems. The Stout mansion was razed in 1959 to make way for the new skyscraper. 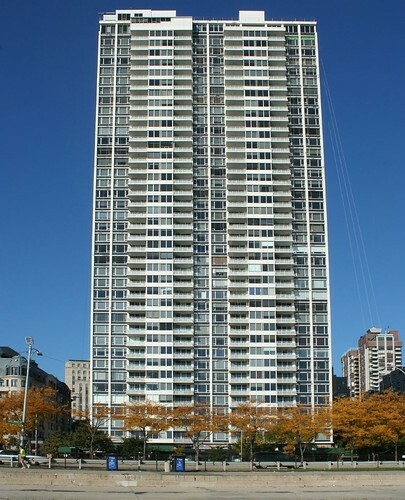 3900 Lake Shore broke ground in September 1958, was topped out in November 1959, and opened in 1960. 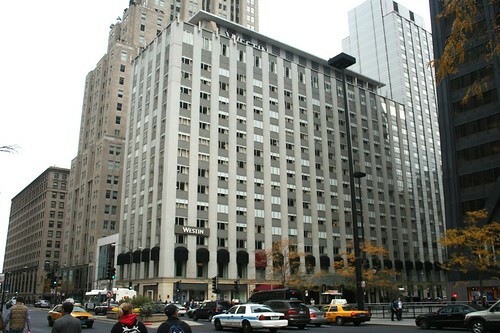 Developed and managed by I. Richard Cobrin, who also did 2970 N. Lake Shore, the building originally contained 240 luxury apartments. Its construction drew the newspapers’ attention thanks to a couple of high-tech innovations that were used. The first was the French-built Benoto caisson digger machine used by Lake States Engineering in preparing the foundations. The “spider-like” machine that could sink caissons down 83 feet to bedrock in about 8 hours, then “walk” away to the next spot when finished; it was also notably quiet. Also of note was an advanced plaster-pumping technique used to send plaster up to the upper floors, where it could be sprayed or hand-troweled onto the walls. 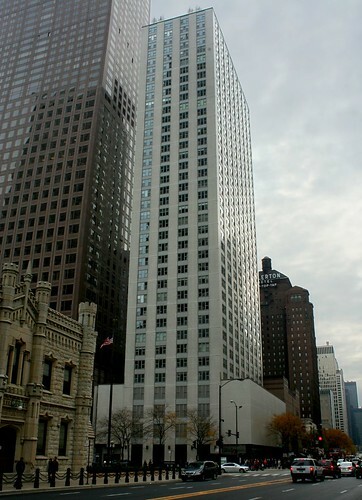 The building was designed by Loewenberg & Loewenberg Architects, a firm founded by Lithuanian-born brothers I.S. Loewenberg and Col. Max L. Loewenberg, and later joined by Max’s son James Loewenberg. James, now in his 70s, remains an active developer in Chicago today. 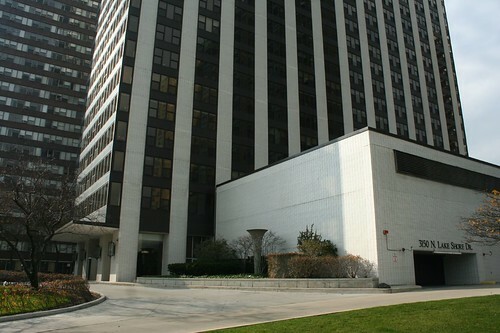 3900 N. Lake Shore was renovated and converted to condominiums in 1977. 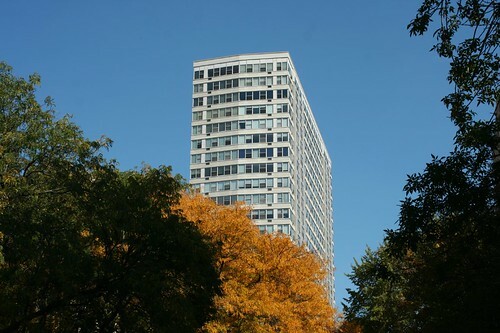 Built by developer Ralph W. Applegate (who soon moved into the building, with his adult son living across the hall) 1300 N. Lake Shore was part of the thriving luxury apartment boom of the early 1960s. 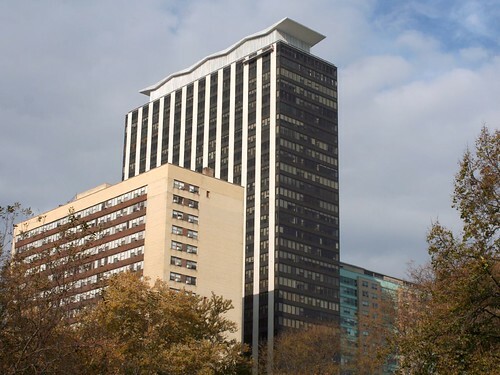 The 40-story tower strove, along with several of its neighbors up and down the shore, to attract the city’s most well-to-do tenants – doctors and lawyers, executive chefs, CEOs and bank chairmen. Construction was underway by mid-1963. 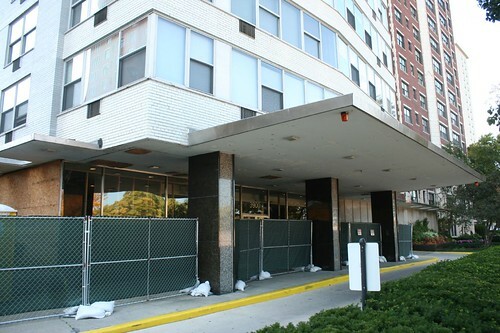 A number of society-notable names were soon among the building’s tenants; rents could run as high as $1800 a month. The 40th floor contained a large ball room originally known as the 1300 Club. Crime and fatality followed glamour and riches; one apartment was robbed of $100,000 of jewels in 1964, and another saw the wife of a mobster die in a bedroom fire in 1966. The fire filled the whole building with smoke and forced residents to evacuate. Another resident, apparently despondent over his failing health, leaped from a 14th story balcony later that year. 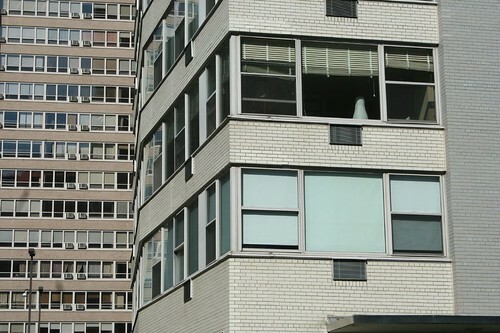 The asymetrical bits along the roofline are a tri-level penthouse, added during the 1976 conversion of the building to condominiums. 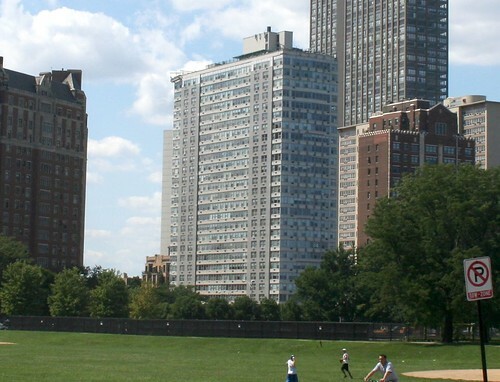 It was designed and occupied by Jack Levin, one of the original architects. 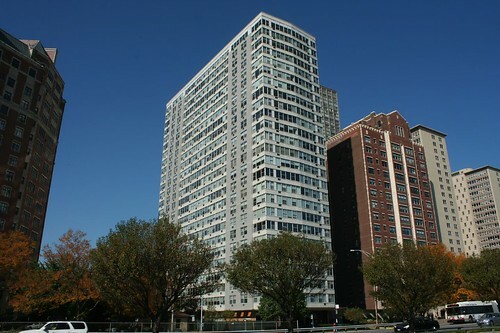 It’s easy to dismiss 1300 as the quintessential ugly 60s building. Indeed, from a distance, it seems little more than a rote assembly of its parts. Yet if you look closely, you can see what the architects were striving for – elements of geometry appear from the building’s spandrels and bay windows, overlapping planes advancing and receding. Even the balcony railings get in on the act, though it’s not clear if they are the originals or a more recent addition. 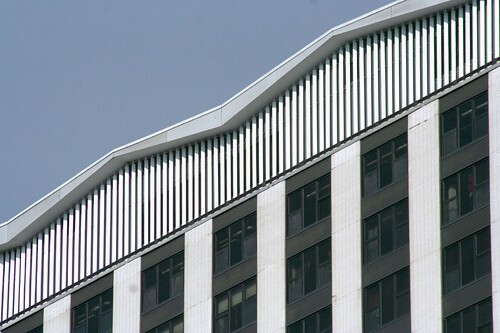 The effect does not carry over onto the building as a whole – but to say there is no design here is to speak without looking. Curiously, Mies Van Der Roes proposed an unbuilt project for the same site in 1956. Mies van der Rohe? Like those contemporary details. 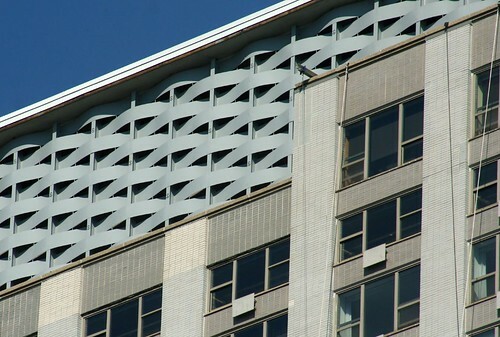 Shaw, Metz & Dolio knew how to top off a buidling. I've always been bemused by these buildings along the Drive. Thanks for putting some names on them. The close up of 1300 makes it look almost Scandinavian, specifically Swedish (I guess I'll have to pull some examples of that, won't I? Don't you just know I never will).